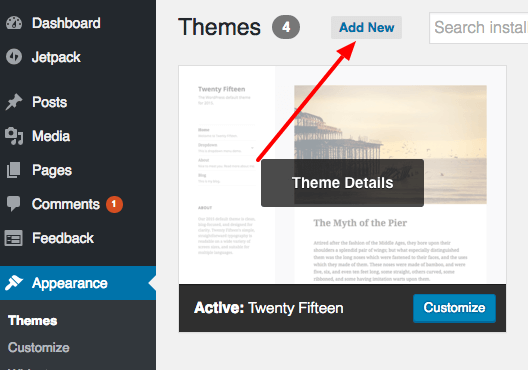 Before beginning the installation process, please make sure you are using the latest version of WordPress and the Theme. We offer free one-click demo import for App Landing Page. So, if you want to make your website exactly like the demo of the App Landing Page theme, you need to install Rara One Click Demo Import plugin, download the demo file, and follow this step by step guide or watch the video below. Thank you for choosing App Landing Page WordPress theme! This documentation covers the installation and the usage of the theme. We encourage you to read through this document and keep it handy for reference. If you have any questions about the theme, or need assistance with anything related to the theme, please feel free to post your questions on our support forum or open a support ticket and our support team will be happy to assist you. You have chosen one of a beautiful WordPress Theme created with love. The main goal of the documentation is to provide guidance and walk-through to set up the theme for your website in an easy-to-follow manner, while also introducing you to some of the features of the theme. First, we'll make sure that everything is ready for the installation, then we'll set up the theme, and cover some initial configuration and customization options. Let’s get started! First, make sure that you have all the necessary things required to install App Landing Page. 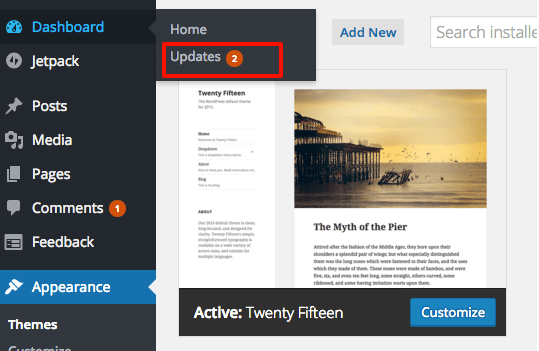 Make sure you have the latest version of WordPress installed, by checking the updates tab from your current WordPress dashboard. If you haven’t downloaded WordPress already, you can download it from the WordPress repository via https://wordpress.org/download/ . Although App Landing Page will work with 4.5 and above versions of WordPress, it is recommended to have the latest version of WordPress. 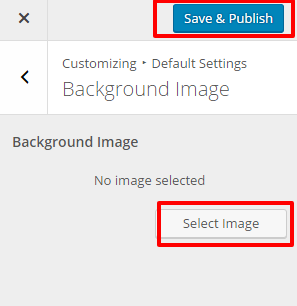 After you have the latest version of WordPress, download the theme, and save it somewhere handy on your computer, as you will be using the included files for the rest of the installation process. WordPress Theme Files— This (app-landing-page.zip) is a compressed WordPress theme file containing all of the required templates, images and icons required for the theme to function properly. There are two methods to install App Landing Page theme. You may either upload the app-landing-page.zip file using the WordPress theme installer (Recommended), or you can unzip app-landing-page.zip and upload the unzipped folder via FTP (Advanced). 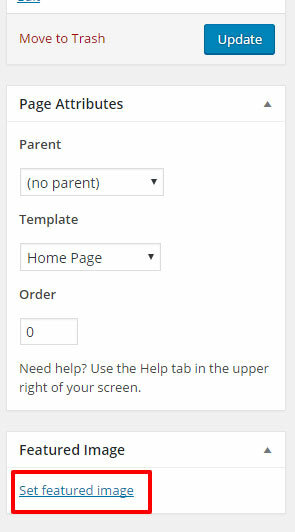 Log into your WordPress site and opens the Administration Panel. Click on Choose File, select the app-landing-page.zip file from your computer and click upload. Unzip “app-landing-page.zip” file on your computer. Login using FTP client to access your host web server. Locate the wp-content folder in your WordPress install files. Upload the un-zipped App Landing Page folder into the: wp-content/themes folder. Log in to the WordPress Administration Panel. Hover over the theme thumbnail and click the Activate button. To install a plugin in your WordPress admin panel and follow the following steps. Navigate to Plugins > Add New. Search for the name of the plugin you wish to install which will return a list of potential plugins. Click Details to read more about a plugin. Click “Install Now” if you wish to install the plugin. It may ask if you are sure, and you may proceed. The installation will commence once you confirm to proceed. After the plugin is downloaded. Go to Plugins>Installed Plugins. Click “Activate Plugin” to make it available for use. The plugin provides a variety of complementary features for your Theme. If you have existing content, this will help you update your image thumbnails sizes. To set up the homepage you must first create a new page. Go to Pages > Add New. Enter the Page Title for the Page. Set featured Image for the home page by clicking on Set Featured Image. The selected Image will then Appear on the Homepage below the Primary menu. The recommended size for the image is 1915*720 pixels. Go to Appearance>Customize > Default Settings> Static Front Page. 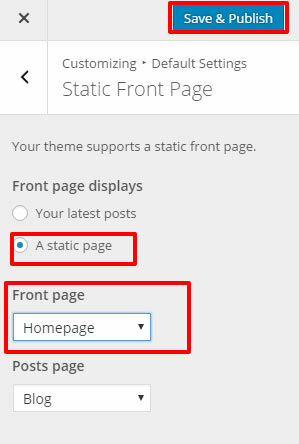 Choose the page you just created with homepage template as Front page. The Featured Image of the Page ( with Homepage Template) selected as Front page will appear as a Banner Image if banner is enabled. Click Select logo by clicking Select Logo. Upload and select the desired image. Check Display Header Text for the Site title and Tagline to appear on your homepage. 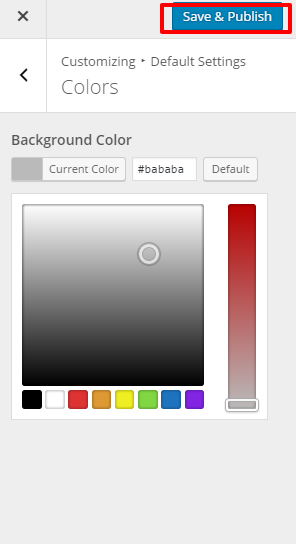 Check to Enable Banner Section. Check to Enable Featured Section. Choose Category for Featured Section. The featured Image of the posts of the selected category will appear under the section. Check to Enable Features Section. Select Page for Features Section. The featured Image of the selected Page will be displayed under the Featured Section. Choose Posts for the Features Section. The featured Image of the selected Post will be displayed as the feature’s Image. Check to Enable Video Section. Select Page for Video Section. The featured Image of the selected Page will be displayed under the section, if no video link is provided. Enter Download Button Text and Download Button URL. Check to Enable Intro Section. Select Page for Intro Section. The featured Image of the selected Page will be displayed under the section. Go to Appearance> Customize>Home Page Settings> Service Section. Check Enable Service Section for it to appear on Homepage. Enter the section title and section description. Select Posts for the Service section. The Featured Image of the selected Posts will be displayed under the section as services. The Title of the posts will appear as service title . The content of the posts will be displayed as description for the service. Go to Appearance> Customize>Home Page Settings> Stat Counter Section. Check Enable Stat Counter Section for it to appear on Homepage. The Title and content of the posts will appear as section title and content respectively. Choose Month, Day and Year of release. NOTE: For the following Options to appear , You must first install and activate Newsletter Plugin. Go to Appearance> Customize>Home Page Settings> Subscription Setting. Check Enable Subscription for it to appear on Homepage. Go to Appearance> Customize>Home Page Settings> Subscription Widget. Add Newsletter Widget to it. Fill Title and Description. Check Enable Social Links to display it on the homepage. Always keep BackUp of your theme before making any changes to the theme. Deactivate the plugins, sometime plugin conflict may cause issues with the theme. Please deactivate the unused plugins. Replace latest modified code with the original code. Copyright © 2019 Rara Theme. All Rights Reserved. Get all our 30 premium themes worth $2070 at just $99! Limited time offer.Get IT NOW!